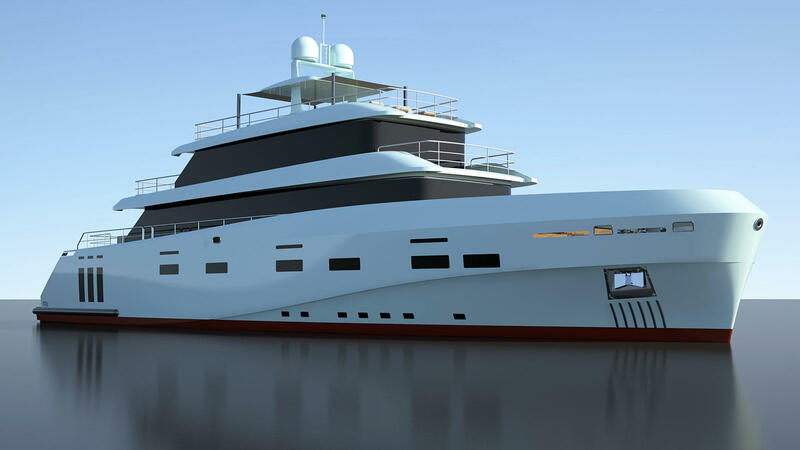 Italian shipyard Cerri Cantiere Navali and Floating Life, who are managing the project, have shared the details of K40 work in progress. The sale of the yacht has been first announced in 2015 and the build started in January 2016. The K40 – the Series-K flagship – is a Light Ice Class vessel, commissioned by an American owner who wishes to cruise in polar latitudes. As of July 2017, the hull has been completely sanded and 4mm finish will soon be applied, specifically designed for a vessel destined to cruise in polar oceans.Propellor-shaft support staffs have been mounted and shaft pre-alignment completed. The underlying deck grill is fully completed and tubing is well along. Most of the electrical cabling has been completed and the main electrics panel will soon be installed. Bottom, lower and main deck compartment construction is on-schedule. Hull and exterior passageway priming has begun. All elements for interior furnishings have been cut to shape and assembly has begun. The garage door has been installed and the overhead lifting mechanism for the tender is about to go in. Preparation treatments for the fuel, fresh water and holding tanks are in their final stages. The first of two projects currently underway at the yard, the four-deck K40 has a length overall of almost 41 meters, with a maximum beam of 9.4 meters. Extremely reliable, easy to run and maintain, a steel hull reinforced in accordance with the Light Ice Class and an aluminum superstructure, all under 500 GT. Differing from most expedition yachts, the K40 will have a very different exterior finish. The layers to be applied will have a total thickness of only 4mm, compared to the usual 10 to 20mm. This will give the K40 a much more beautiful appearance and a smooth hull without the usual imperfections of steel plate construction. This will be even more noticeable with completely faired welding ridges, a technique approved by the classification body. CCN has recently announced the acquisition of a new order from an Italian owner for a 27m Fuoriserie yacht. She represents a fully-customized project pencilled by designer Tommaso Spadolini, who took care of both the exteriors and the interiors.